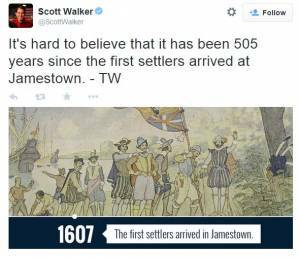 Scott Walker can't believe it's been 505 years since settlers arrived in Jamestown -- maybe because it hasn't? Wisconsin Governor Scott Walker tweeted today that "it's hard to believe that it has been 505 years since the first settlers arrived at Jamestown," and for once, he was correct about a matter of history. It is difficult to believe that it's been 505 years since the founding of the Jamestown colony in 1607, because it hasn't been. The libertarian-leaning Wisconsin Governor believes we are living in the year 2112 -- which makes a certain kind of sense, being the title of libertarian futurists Rush's best album, but which is absolutely not the year we are currently living in. "Team Walker" later tweeted that the "505" number was a typo -- and not evidence of the sort of mathematical skills Americans living in the year 2112 will actually possess if Walker continues to pillage his state's educational system in order to build arenas for basketball teams. This isn't the first time "Team Walker" has tried to hijack popular culture to hilarious -- albeit unintended -- effects.